As they are otherwise know are printed to your own specifications. This allows you to decided the layout and style that best suits your business and brand. NCR Docket books are an effective tool in reducing mistakes and is a remind for the employee to ask and fill in the right questions, they are especially useful in coordinating and recording all procurement and purchase related transactions. 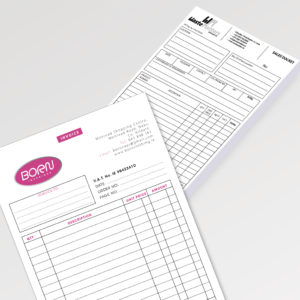 NCR Docket books printed by ClickPrinting are used in a variety of industry sectors as well as multiple applications ranging from invoices, quotations, receipts, log books, café order books. Please choose from our selection of printed NCR Docket books, along with your selected copies and size.